You may have been referred to us by your child’s dentist to have their wisdom teeth removed, either because of impaction or orthodontic reasons. Or maybe, your teenage son or daughter may have recently complained of wisdom teeth pain in the back of their mouth that exacerbates periodically. Either way, wisdom teeth are known common sources of many problems, and their removal prevents localized disease and promotes long-term health. Here is some relevant information before you decide to proceed. Parent's guide to wisdom teeth extraction from H. Ryan Kazemi, DMD on Vimeo. Wisdom teeth often develop decay, gum tissue inflammation, or infection which can cause significant pain. This pain may be mild and occasional, or it may suddenly escalate within a few hours. Infection can also develop quite rapidly causing facial swelling, difficulty opening the mouth or drainage. If you are experiencing pain or swelling with your wisdom teeth, call us at 301-654-7070 for immediate assistance. Wisdom teeth frequently become impacted or stuck behind the second molars. When this happens, it becomes challenging to brush in the area, and oral hygiene suffers. Also, plaque buildup can cause inflammation that leads to infection, decay, or gum disease. Even if erupted (visible in the mouth), these teeth can harbor bacteria and are highly prone to gum disease and loss of bone. Wisdom teeth may also cause jaw cysts or shifting of adjacent teeth. Recently a published paper in November 2011, ‘Advocacy White Paper on Evidence-Based Third Molar Surgery’ for important information on making the right decision about your wisdom teeth. Why extract wisdom teeth? from H. Ryan Kazemi, DMD on Vimeo. Removal of all four third molars at once during the teenage years is the best treatment approach for wisdom teeth removal. However, it’s not too late to have the procedure as an adult. The disease caused by wisdom teeth is progressive and can only be stopped by extraction, allowing improved access to hygiene. Early removal is recommended to prevent the associated problems, as well as to minimize the risk of potential complications. The procedure is typically 20 to 30 minutes, followed by 30 to 45 minutes of recovery before going home. For enhanced healing, ask for platelet rich growth factor. 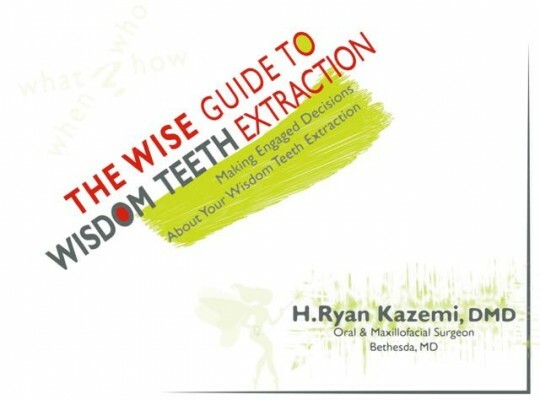 Best treatment approach for extraction of wisdom teeth from H. Ryan Kazemi, DMD on Vimeo. Anxiety is not uncommon among people having their wisdom teeth extracted. This concern is mostly related to hearing others’ bad experiences with excessive pain, swelling, or complications. We resolve this in several ways. First, the use of IV sedation allows patients to nap during the surgery this helps greatly to make them comfortable and reduce anxiety. Second, a group of friendly and experienced staff members takes care of the patient. They take time to personally connect with each patient and allay their fears and concerns. Third, the surgery is done conservatively, which minimizes or avoids swelling, pain, and complications. The best way to manage anxiety and make sure you have the best possible experience is to opt for IV sedation. It is the recommended method and chosen by many patients. Dr. Kazemi is trained and licensed in administering office anesthesia. Its safety is attributed to continued monitoring techniques, the short acting nature of the medications, availability of emergency equipment, and, most importantly, proper training of the surgeon and the staff. Another option is local anesthesia, with or without nitrous oxide (laughing gas), but in that case, the patient is completely awake and fully aware of the procedure. IV sedtion anesthesia for oral surgery from H. Ryan Kazemi, DMD on Vimeo. Complexity of surgery: The more complex the surgery, the higher the chance of increased discomfort, swelling, and overall recovery. Surgical approach and technique: Conservative and minimally surgical approaches can minimize discomfort, possibly avoid swelling, and speed of recovery. Length of surgery: Typically, longer surgical procedures require more healing and recovery time. Post-operative instructions: You can improve your recovery by closely adhering to both pre-operative and post-operative instructions. Follow them closely and you can recover faster. Individual’s physiology and healing potential: This is highly variable between different individuals. Good nutrition and general state of health help to speed up your recovery. The level and duration of pain depend on the complexity of the surgery, the technique, and patient’s tolerance. Most patients experience three to four days of elevated pain, commonly managed with pain medications such as Vicodin or Percocet. As pain gradually diminishes over the next two to three days, Ibuprofen (Advil) or Acetaminophen (Tylenol) can be used. After seven to ten days, most patients no longer have pain and may stop their medications. Any swelling related to surgery will maximize in 36 to 48 hours following the procedure and gradually taper over the next five to seven days. Ice helps to reduce swelling in the first 24 hours. If extractions are done with a conservative approach, you may experience no swelling at all. Upon arrival home, you may have water, juices, soups, shakes, purees, and very soft foods. A soft diet is recommended five to seven days. No hard, crispy, or spicy foods should be eaten during this period. The general rule is if you have to chew, it’s probably too hard. After seven days, patients may gradually return to normal food. Get plenty of rest on the day of surgery. Some patients may feel well enough the following day to walk and go out. That’s all right but take it easy. Avoid strenuous activities for the first two to three days. Refrain from sports, lifting, or doing anything that requires exertion. After three days, if the patient feels more comfortable, he or she can walk, go for a gentle swim, or do very low-impact exercise. Mild activities may cause some pain but not enough to disturb the surgery site or open the sutures. Most patients return to work, school, or some normal activities one to two days after surgery. Most schedule their surgery on a Friday and are ready to return to wok or class by Monday. There is no problem with traveling or flying the following day, although it’s best to rest for a day or two. Of course, there are always variations in overall response and recovery. Treatment cost, insurance benefits, and payment plans depend on number of teeth, type of impaction, and complexity of the wisdom teeth procedure in your case.